Why walk around with multiple glasses cases when you can stick two frames in one handy case? OptiPlix's Dual Glasses Clamshell Case has you covered with two separate compartments for either glasses, sunglasses or reading glasses. No matter where your travels take you, whether on vacation or a business meeting or convention, nothing beats the convenience of having one compact storage and protective holder for a couple pairs of glasses. Whether it is a combo of shades & readers, or sunglasses & prescription glasses, or even two different styles of glasses, keep them together and save space with this handy double case. These hard cases are designed to be impact resistant, and handle drops, falls and other kinds of damage. The soft felt interior ensures your lenses don't get scratched or damaged. At OptiPlix we pride ourselves on producing innovative, practical and convenient optical products made with high quality materials, built for long-lasting wear. We are confident you will love our products, but if there are any issues at all with your order, let us know and we will resolve them as fast as possible. DOUBLE LAYER: This case has two compartments; one holds a pair of large glasses, including sunglasses, the other holds medium frames like readers or standard glasses. TRAVEL SMART: Whether on business or vacation, this makes a perfect travel accessory. 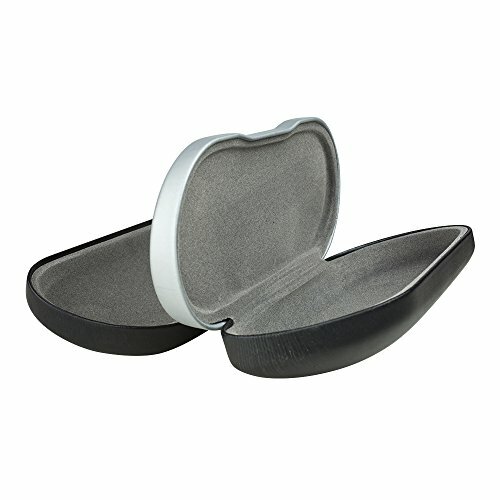 You can easily store contact lenses and glasses in one convenient, compact holder. PRETTY & ELEGANT: Pick from a variety of 10 colors and styles, from casual to formal, shapes and patterns to pictures and prints. Whatever your style, there's one for you. HEAVY DUTY PROTECTION: Made from high quality materials, these protective hard clam shell cases will protect your lenses & eyewear from getting scratched or broken. FOR ALL FRAMES: The glasses section can fit medium to large frames, kids or adult. Keep a pair of sunglasses or reading glasses alongside your contacts for quick access.FOR ALL FRAMES: The glasses section can fit medium to small frames, kids or adult.